Oscilloscope will only measure voltages as a function of time. However, we are often interested in something other than simply voltages in a circuit; we would often like to have a representation of current. Most oscilloscopes provide one or more math channels which provide the ability to calculate and plot simple mathematical functions of the measured voltages. Adding or subtracting voltages measured on two channels, for example, are common math functions which are available on most oscilloscopes. 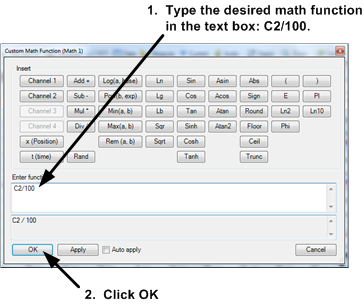 In this project, we will introduce the use of the math channel function on the Analog Discovery™. 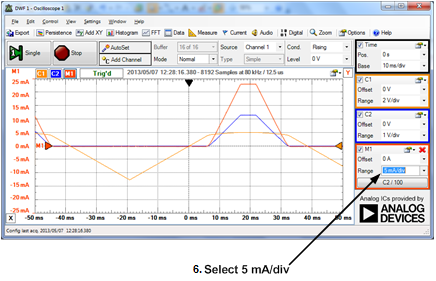 The Analog Discovery's math channels provide the ability to perform a wide variety of mathematical operations, all of which can be applied to the voltages being measured. We will use a math channel and Ohm's law to determine the current in a resistor. Complete the third scope project relative to Measurements and Cursors. 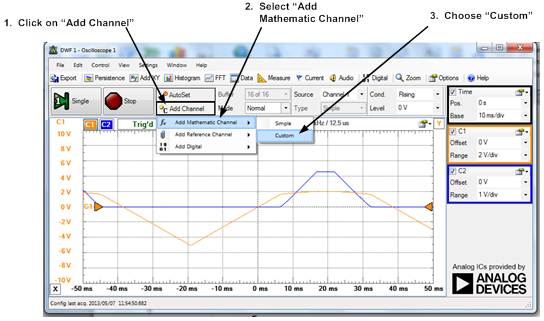 Use the Analog Discovery oscilloscope math channel. To continue where the Measurements and Cursors project left off, simply close the Measurements window and remove the cursors from the screen by dragging them back to their starting positions at the lower-left and upper-right of the scope's main time window. We want to find the current I through the 100Ω resistor in the schematic shown to the right. The channel 2 terminals (2+, 2-) are used to measure the voltage difference across the resistor terminals. A Custom Math Function window will open. This window provides buttons with a number of math functions, and a text box where a mathematical function can be typed. 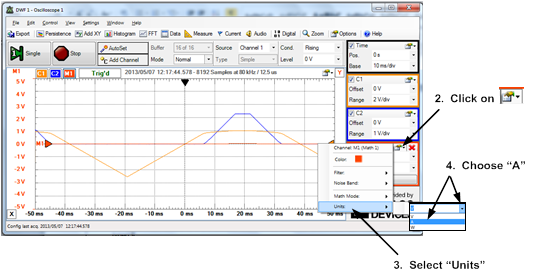 The Custom Math Function window will close, and a red line will appear on the main oscilloscope window. Change the scale on the math channel to 10 mA/div. The math channel should now almost exactly overlap the Channel 2 signal. Does this result agree with your expectations, based on the math function of step A?